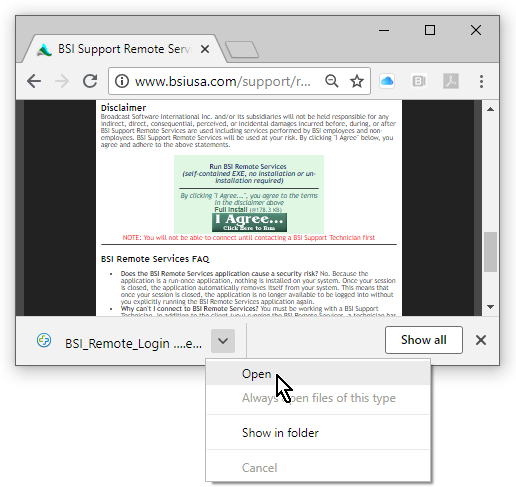 BSI Support Remote Services allows BSI technical support engineers access directly into your workstation to troubleshoot issues or work alongside you for walk-through training. BSI Support Remote Services are free to Platinum Support Tech Care Plan holders for troubleshooting technical issues. BSI Remote Services are free for paid training sessions. Contact BSI Sales by phone at 1-888-BSI-USA-1 to purchase a training session. For users with standard Tech Care Plans there is an additional cost associated. To order training sessions or to set up a one-time Remote Services session for standard Tech Care Plan holders, contact BSI Sales by phone at 1-888-BSI-USA-1. Contact BSI Support at 541-342-5250 to initiate a support session with a BSI support technician (you must have a valid and current Tech Care Plan). 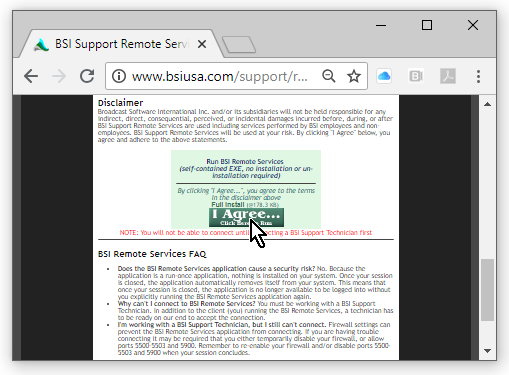 Read the Disclaimer below, if you agree to the terms click on the I Agree... button at the bottom of this web page to download the BSI Remote Login remote client application, as shown in figure 1. When download is complete, double-click on the icon for the downloaded file, or click on the down-arrow and select Open from the pop-up menu as shown in figure 2 (NOTE: The Chrome browser is shown. Other browsers may have alternate steps to run the downloaded file). 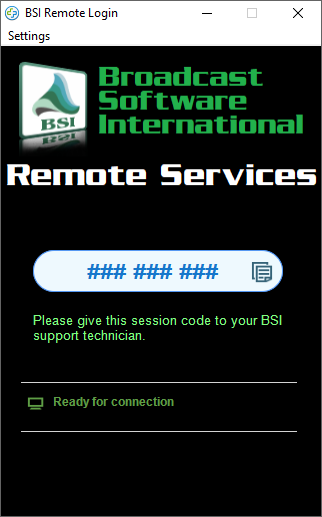 When the BSI Remote Login app opens, a 9-digit session code will be displayed (as shown in figure 3, where "### ### ###" is displayed). Give this 9-digit code to your BSI support technician and they will initiate your remote session. Your remote session will now begin! Broadcast Software International Inc. and/or its subsidiaries will not be held responsible for any indirect, direct, consequential, perceived, or incidental damages incurred before, during, or after BSI Support Remote Services are used including services performed by BSI employees and non-employees. BSI Support Remote Services will be used at your risk. By clicking "I Agree" below, you agree and adhere to the above statements. Does the BSI Remote Services application cause a security risk? No. Because the application is a run-once application, nothing is installed on your system. Once your session is closed, the application is removed from system memory. This means that once your session is closed, the application is no longer available to be logged into without you explicitly running the BSI Remote Services application again. Why can't I connect to BSI Remote Services? You must be working with a BSI Support Technician. In addition to the client (you) running the BSI Remote Services, a technician has to be ready on our end to accept the connection. I'm working with a BSI Support Technician, but I still can't connect. Firewall settings can prevent the BSI Remote Services application from connecting. If you are having trouble connecting it may be required that you either temporarily disable your firewall, or allow ports 6783-6785 and 443. Remember to re-enable your firewall and/or disable ports 6783-6785 and 443 when your session concludes if you wish to re-block connections on those ports.